In a unique program in a Tulsa suburb, kindergartners and elders learn from one another. The Grace Living Center, a nursing home in Jenks, Oklahoma, hosts 170 residents. It's also home to a kindergarten and two pre-K classes, part of the Jenks Public Schools. Students call the elders "grandmas" and "grandpas." At the same time every morning, Paul Bookout sits impatiently in his wheelchair, looking out the front door of the Grace Living Center. He's not waiting for family visitors, and he's not longing to be away from this nursing home. He's waiting for the children. Just before 9 a.m., a stream of five-year-olds comes through the door, calling out greetings and hugging their "Grandpa Paul." 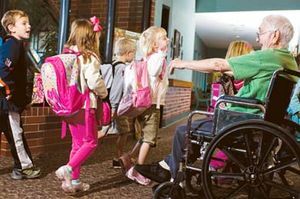 Though Bookout can't speak as a result of a stroke, he points and smiles with delight as he follows these kindergartners to the door of their classroom, here in the nursing home. The Grace Living Center is home to two classrooms of about 60 kindergarten and prekindergarten students, as well as to 170 elders, who are "grandmas" and "grandpas" to the students. Kids attend the center in lieu of the first two grades at another school in the district, then switch at the start of first grade. Far from just a heartwarming partnership, the school housed in the GLC provides students with daily mentors in their academic and social development, yielding proven results in reading and vocabulary. Its success has inspired the opening of a similar school in Kansas and is a model for intergenerational learning, even in more traditional settings. The partnership came about in 1998, when Don Greiner, president of an Oklahoma nursing home chain, started construction on a facility in Jenks. Noticing a school district-owned daycare center next door, Greiner approached the district about upgrading the playground, thinking that the sight of kids playing could uplift his residents. The idea of a collaboration snowballed as the GLC and Jenks Public Schools found that their goals aligned. Ageless Friendship: "Grandpa" Paul Bookout welcomes kindergartners to school at Grace Living Center. The GLC works to eliminate loneliness, helplessness, and boredom in aging populations; the district's curricular vision, says Shan Glandon, director of curriculum and instruction, is "to make learning as engaging and purposeful as we can," focusing on integrating content with real-world ties. Eventually, all parties agreed to create two classrooms inside the nursing home; the GLC paid about $200,000 for construction and leased the space to the district for $1 a year. 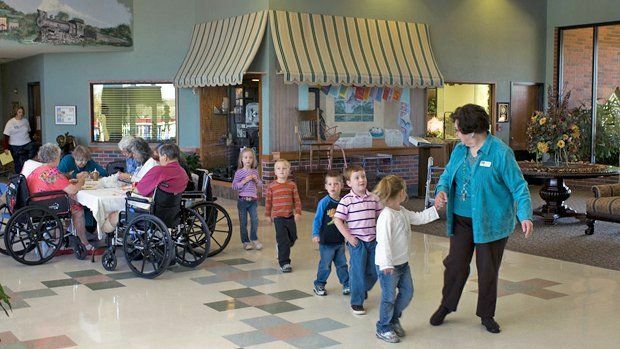 School and nursing home are integrated in both physical design and curricular planning. Classrooms wrap around the beauty shop and between the GLC's atrium and dining hall. Sliding glass doors open onto the hallway, and pane-free windows allow children's voices to float through the home. Parents drop kids off at the GLC's front door: They snake through the home to get to class. And elders maneuver their wheelchairs up to huge windows to watch kids play on the playground, or go out to the play area themselves. To ensure curricular ties, the GLC employs a full-time liaison -- the energetic Elaine Arnold -- who identifies mentoring opportunities for every interested resident and is present any time kids are with elders. The district allocates time for Glandon to meet regularly with Arnold and the teachers, and every four to six weeks, the group reviews the curriculum taught in all 30 of the district's kindergarten classes, identifies unit objectives, discusses skills they should reinforce, and brainstorms activities in which grandmas and grandpas can help students learn. The curricular hallmark of the partnership is "book buddies," which pairs rotating groups of elders and kindergarten students who read to one another for about 30 minutes several times a week. Grandpa Charles "Charlie" Lamson, who moved to the GLC after suffering a stroke, has participated for about a year. "I always start out saying, 'Are you going to read to me?' " says Grandpa Charlie, a tall man wearing a Tulsa Drillers baseball cap. "It's such a good feeling to just listen, read along, and help with words," he explains. "I know how important it is to learn to read, and if I can read to them now, that's a big help down the line." Grandpa Charlie is right. Since 2004, the Jenks Public Schools has tracked the number of students entering first grade whose reading skills are below grade level. Consistently, a smaller percentage of students from the GLC have required reading intervention once they entered first grade than those who attended prekindergarten or kindergarten at the nearby West Elementary School, which has a similar population but no intergenerational partners; for the last three years, the difference has been about 10 percent. Another key program is "shared study," in which elders join small groups of kindergartners in hands-on activities. On the day of my visit, Grandma Irene rolled her wheelchair up to a round table where a handful of kids were creating books of fall leaves. She talked about making Christmas ornaments from leaves as a child, and throughout the activity helped students measure, color, describe textures, and make rubbings. Earlier in the month, students had made scarecrows while elders talked about growing up on farms; they worked together guesstimating the circumference of pumpkins. During a unit on senses, residents helped with taste tests. According to kindergartner Liam, "We do activities, like trying new food. I tried a mint leaf and dark chocolate. I like school better with grandmas and grandpas." Site principal Suzanne Lair says shared study is developmentally appropriate for both groups. "Things like cutting and pasting with the kids helps the residents not lose those motor skills," she adds. Dramatic play is also important, as residents join prekindergarten students in enacting a scenario connected to the unit of study. Using props and costumes to set the scene -- like Thanksgiving dinner, a vacation, a trip to the doctor's office -- the teacher gets the ball rolling, then kids, grandmas, and grandpas begin improvising. "This is all in the service of language development, interacting with vocabulary," says Lair. To promote connections between the generations, teachers look at class themes through the lens of "then and now." In the My Classroom unit, for instance, students and elders compared how they traveled to school; in Healthy Habits, they discussed lunch choices and options from the past and today. Sometimes those discussions become big books created by the students and elders. Although all Jenks schools weave instruction of core values -- compassion, responsibility, perseverance, for instance -- into the curriculum, GLC students learn in an environment where those lessons are naturally reinforced. Lair says, "Students' understanding of respect takes on a whole different meaning as they learn about respecting the individual homes of the grandmas and grandpas within the nursing home. They learn about responsibility and self-discipline when they see the grandmas and grandpas coming to read with them every day. They experience tolerance and acceptance of physical differences when there is a resident who carries an oxygen tank or has difficulty speaking." Instructors teach these core values explicitly, too. Following the Tribes program philosophy, in which a sense of safety and tribe-like community is incorporated into the classroom, teachers define and model ideas like "good listening." At the beginning of the school year, and before any new activity with elders, Arnold prepares kids with discussions, posters, and a review of the rules. "I say, 'Grandpa Buddy was in the war and lost a leg. Should we talk about people without feet or legs?' I let children share about that." Mundane school rules have urgency at the GLC; students who don't maintain ordered lines might be in the way of an ambulance worker with a gurney or a frail elder with a walker. Arnold says, "I tell them point blank, 'If we knock Grandma down, she might break her hip.'" Rich social and emotional learning comes as a response to the environment. Kids observe teachers greeting and touching the grandmas and grandpas, asking them questions. Prekindergarten students visit residents in their rooms, learning to knock and asking permission to enter. Arnold talks to children individually if they show any disrespect or lack of compassion. And death is dealt with head on. A few years ago, when a grandparent died, the class brainstormed how to support the family. "They ended up creating a book, with each child contributing a page about his or her best memory of the person," says Lair. "They took a real-life event and applied skills they'd learned -- in writing, storytelling, and compassion." Not only do kids learn about difference, illness, and aging in a supportive environment, but elders gain a real sense of purpose. "These kids are better readers because the grandmas and grandpas are there reading to them five days a week," says GLC president Don Greiner. "Here, we have elders, who our society has parked somewhere, having that impact. This is an opportunity for them to mean something and be something." The relationships built in the academic work spill over into the home's social events, too. Grandpa Charlie appreciates even the smallest acknowledgments from kids at weekly ice cream socials. "You're sitting there eating and a kid you worked with in the morning will come up and ask, 'What kind are you having, Grandpa Charlie?' and it almost tears your heart out," he says, choking up, "that they would remember me." Teachers, too, reap the benefits. "I've learned more about the stages in our lives," says prekindergarten teacher Glenda Fitzgerald. "When you become a teacher, you want your kids to succeed, you want to see children learning and growing. The bonus here is that you also get to see the elders grow and learn. I get goose bumps about both." Lisa Morehouse is a freelance writer and radio reporter in San Francisco. Go to "How to Build Intergenerational Opportunities for Learning."